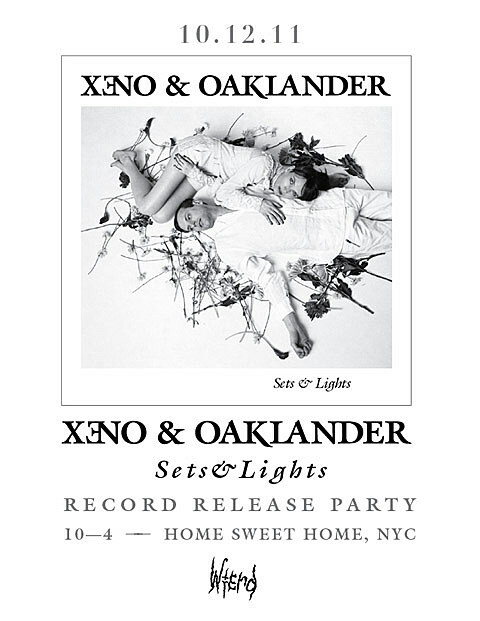 Xeno & Oaklander are New York’s premier minimal wave, and have been doing it 1981 style — using patch bays and vintage equipment exclusively, no laptops — for over five years. Despite the duo’s neo-luddite approach to making electronic music, Sean McBride and Liz Wendelbo have certainly gotten better at what they’re doing, both mastery of their gear and in songwriting. Sets & Lights, which was released this week on Wierd Records, is the band’s third album and easily their best. Arpeggiated synths and sequencers bubble along and Wendelbo and McBride trade vocals… it’s like the soundtrack to some gleaming baroque futureworld. You can download “Autumn’s Edge” at the top of this post, and be sure to check out the genuinely spooky video to single “The Staircase” further down. Xeno & Oaklander have a few shows coming up. Tonight (10.12), they celebrate the release of Sets & Lights tonight (10.12) at the weekly Wierd Party at Home Sweet Home. Friday night (10.14) they’ll play the afterparty of the first night of the Neon Marshmallow Festival which is happening all weekend at Public Assembly. 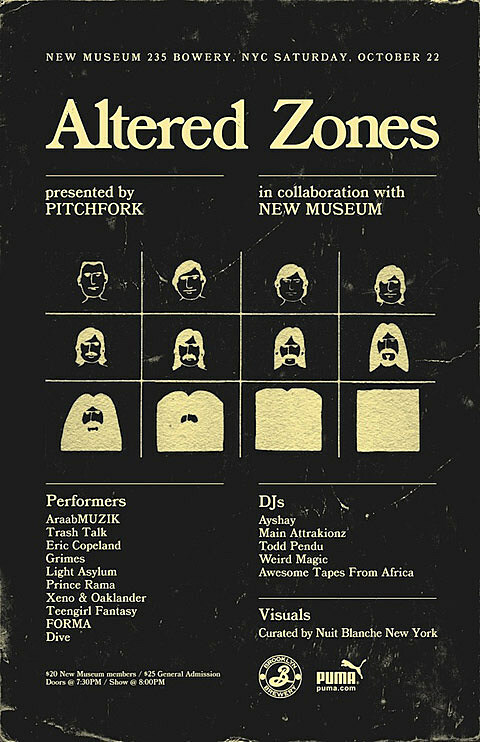 Then next Saturday (10/22), Xeno & Oaklander play Altered Zones at the New Museum, which seems to be this year’s attempt by Pitchfork at CMJ counterprograming. (Remember #Offline?) In addition to X&O, performers include AraabMuzik, Grimes, Teengirl Fantasy, Trash Talk, Eric Copeland, Prince Rama, Light Asylum, FORMA, and Dive. The show is 21+ and $25 for non-museum members and a portion of the proceeds goes to benefit the 2012 New Museum Triennial, an international exhibition of emerging artists. This actually sounds potentially cool. Flyer for the event is below.